In this game, there are 27 picture cards (3 cards for each colour) and 9 cards that contain clues (1 card for each of the nine colours covered in the game). The teacher/parent-teacher decides how many cards he/she will present to the child(ren). 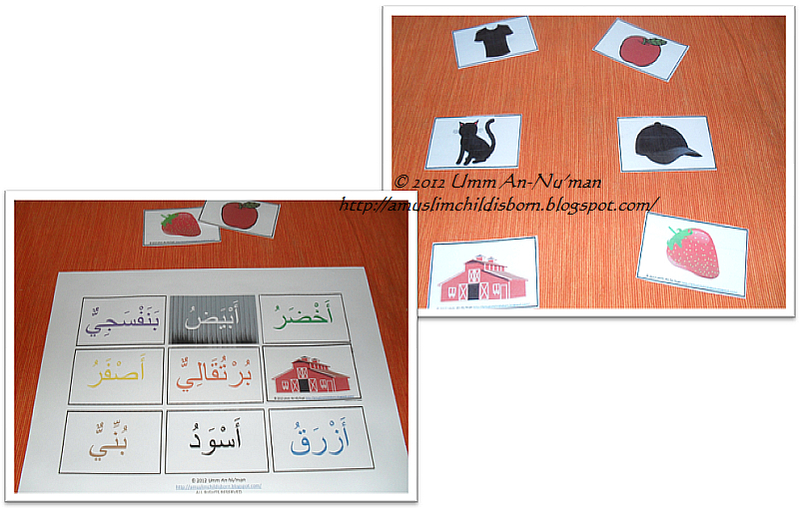 When first presenting the game to children, it is a good idea to start with 6 cards (i.e. 3 cards for the 2 colours you will start with). As the child understands the game and shows proficiency, the teacher/teacher-parent can increase the number of cards presented at one time and incorporate using the game board insha'Allaah. To play, the teacher reads the clues to the child(ren) one at a time, providing time for the child(ren) to process the clue. 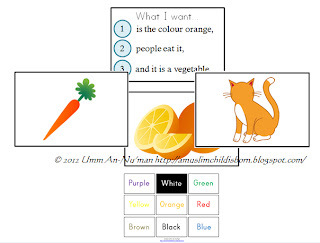 Using the example pictured above, the teacher will read: "What I want is orange." The teacher pauses to allow children time to take all of the orange cards from among the other cards. 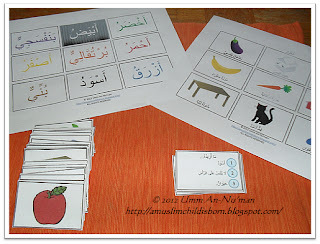 When the child has removed all of the orange cards and has lined them up in front of him, the teacher reads the second clue: "People eat it." Again, the teacher pauses allowing the child to process the clue and act on it. Here, the child may notice that there are two things that people eat (i.e. the orange and the carrot). The child will remove the card showing the cat because this card can no longer be the card the teacher is asking for. The teacher reads the next and last clue: "And it is a vegetable." The child will look at the two cards he has in front of him and realize that the card the teacher is asking for can only be the carrot because an orange is a fruit. 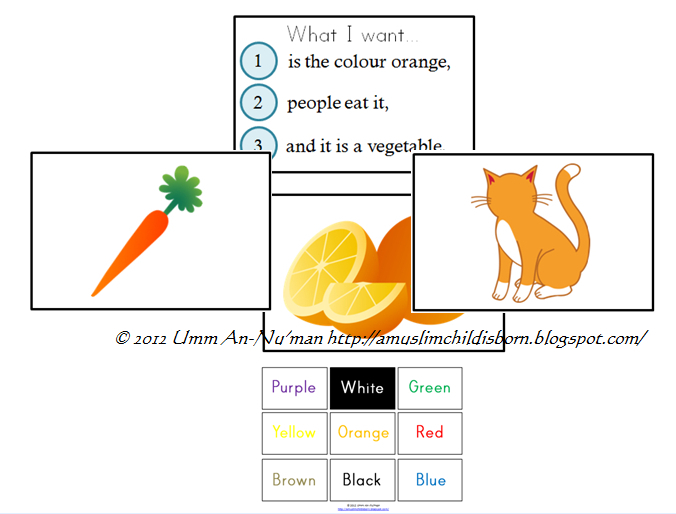 The child will take the card showing the carrot and place it on their colour mat (pictured above) in the spot that says orange. The teacher plays the game in this fashion until the child has completed the board. Each card has 3 clues and after the first clue is given the child will always have two cards remaining that are possible answers. The child will not usually know the card the teacher is asking for until the last clue is read. Assalamualaikum, may Allah reward you abundantly!